We are no stranger to appliance repairs at TOG. In the past we have taken part in Repair Cafe’s, and we’ve looked at things brought to us by members and visitors. This time it was a Beko DW600 dishwasher that kept burning out its water heater relay every few months. The heater should only be on when heating the water but it seemed to be on all the time, and the machine could be heard gurgling and hissing when filling. 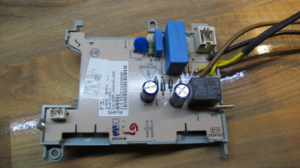 On investigation, the Omron G5 relay that powers the water heater had failed with visible burning on the case. The relay failed in the ON state. This is a very cheap part…. less than 1 Euro. After replacing it several times a few months apart, a bigger and better relay was found after a rummage through our electronics room. A Crydom D2450 solid state relay rated at 45 Amps and zero-crossing switching no less! This should have no trouble handling the approx 7.5A that the heater draws. What was causing the original relay to fail is not certain. It doesn’t have much air circulation where it is mounted, and the the location of the control PCB itself is very close to the hot inner door of the dishwasher. So time will tell if the new relay can handle the job. This was written by gary. Posted on Tuesday, August 8, 2017, at 8:47 pm. Filed under Project. Bookmark the permalink. Follow comments here with the RSS feed. Post a comment or leave a trackback.